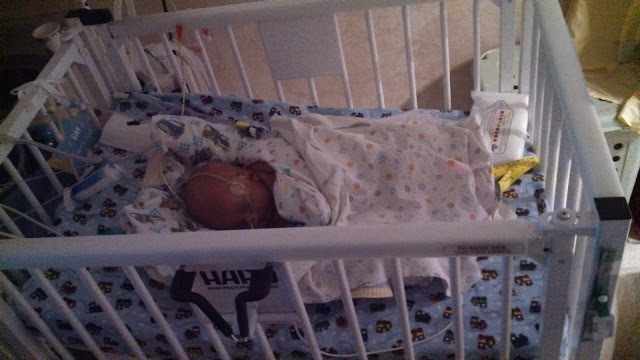 Well Rayden finally got out of the heated hospital bed today he is now an a baby crib because he is maintaining his temperature on his own tomorrow we have a big meeting with the doctors his nurses and the neurologist and all the other people that have invested time in his care. I am excited because I want to know exactly what they think the outcome for his future is going to be and to get multiple peoples opinions on his future I will keep everyone updated thank you all love you and keep up the prayers they are much appreciated. Hi Amy, my name is Ruth and I live in St. George. I don't remember how I came across your blog but I have been praying for you and your sweet baby since I started reading your story. Thank you for sharing your deepest feelings with us. I admire your strength through such a difficult time. While there is no way I could understand exactly what you're going through, I can relate on a fundamental level, I think. My baby had to have surgery at 3 weeks to remove a tumor she was born with. I know the agony and the guilt that comes with leaving your baby alone in the hospital. I wonder if your surgeon was the same as ours--Dr. Meyers? My heart goes out to you. Keep the faith hun. some video of my cute little man! I love my little man!! !